Loppers are the second most useful tool in your pruning arsenal. The long handles let you reach far and exert high leverage with minimal exertion, letting you comfortably cut anything that can fit entirely between the blades when open. Typically, this includes wood of up to one inch in diameter or more, but for most of your cuts on much smaller wood, you’ll prefer the accuracy and one-handedness of pruners over loppers. For thicker wood, you’ll need a pruning saw. This guide will help you make the best cut you can when it is time to use loppers, your most versatile pruning tool. In terms of their type of cutting action, loppers fall into the same two types as hand pruners: bypass and anvil. Bypass loppers, the most common kind, have a single-edged blade that slices past a thick base as it closes. Anvil loppers have a blade that slices to the center of the fat lower base, contacting that base at the completion of the cut. These are less precise and clean-cutting but exert higher force, and so are used for thick dead wood or less precise cutting. Perfect cut location for bypass loppers: For the most exactly-placed cut, line up the blade itself with your cutting site. Remember that the blade passes to the side of its thick base, so the precise spot that the blade comes through shifts about a 1/4” when you flip the tool. Get the wood deep into the loppers. Completely open your loppers and get the branch deep into the blade, all the way in. It’s tempting to snip-snip wood like scissors might cut paper, but this weaker cutting method will stress your hands and dull the blade quickly. Make the cut. With the wood properly positioned, close the loppers through the branch in one fluid motion. Work comfortably. Don’t use the loppers with extended arms unless you have to, as this will tire your arms fast and may cause you to make a weak cut. 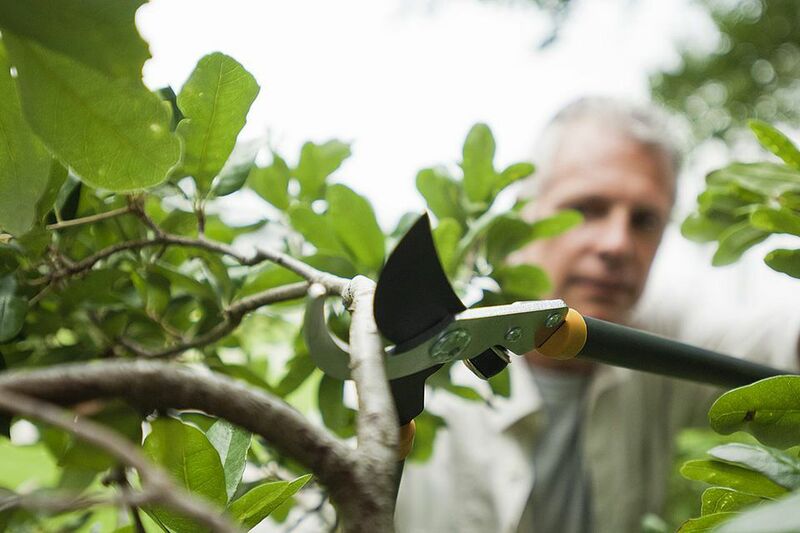 Do use loppers to help you reach cuts that would be hard to get to with pruners, deep in a shrub or slightly overhead. Don’t let bypass loppers twist as you cut. Keep a firm grip on the handles as you cut and don’t let the tool rotate. If you use loppers on wood that is really too large or dense for them—hey we all do it every so often—the added strain you will have to exert will make the tool want to twist. If it twists, the cut won’t be clean. If you feel this happening, consider switching to a pruning saw. Don’t overuse your loppers. Loppers can cut anything hand pruners can, and with their long handles, they can let you exert enough force to cut a lot more, including things you should be using a saw for. You can also work with them at a distance. It can get tempting to rely on these too much, but don’t! Hand pruners are lighter and less tiring to use on small wood, and saws are the only way to cleanly cut wood that is too large to fit deep into your lopper blade. Keep ‘em sharp. Loppers are the first tool to go dull. They cut thicker wood than hand pruners and don’t have the teeth of saws. They are easy to misuse, which dulls them faster. When you sharpen them, see where the metal is rolled over and dulled. Is it much worse near the tip of the blade than the inside? You’re using the tool wrong; get that wood in deeper. Clean your loppers before storage. Wipe blade surfaces clean, dry them, and if they’ll be stored for a longer time without use, apply a thin coating of oil (spray-on works fine). This prevents rust from air moisture. What Type of Old Fashioned Hydrangea are You Growing?